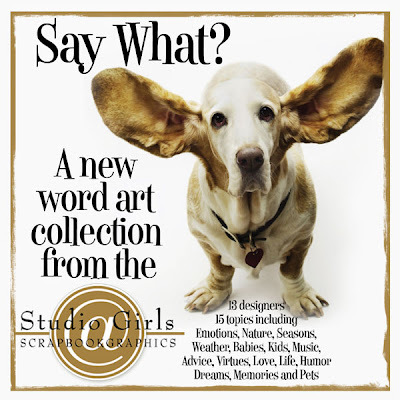 Rumor has it that the Studio Girls at Scrapbook-Graphics will be unveiling their latest kit, titled "Say What?" It is supposed to hit the store tomorrow; there will also be a COUPON FOR $5.00 off of the purchase price. It has about 100 quotes/words/titles . You can't beat that! As we all know, coming up with quotes and good wordart for your pages is often time consuming and hard...this collaboration has 15 topics such as emotions, nature, pets, memories, dreams, kids, weather, humor and more.